Are you thinking about a new pre-amp? A new streamer to go with your pre-power? Then Naim's new pre-amp streamer maybe what you are looking for. The NAC272 is Naims latest Pre-Amp and if it were just a Pre-amp it would be an awesome partner to most power amps. It doesn’t just fulfil that role (admirably) as it also incorporates a Streamer. Anyone who knows how streamers work will understand that a large percentage of getting streamers to right is the interface used to control it. Naim do not disappoint (as many do), instead they allow simple control from either android or Apple devices. As its a Naim streamer it also sounds excellent and allows the streaming of files up to 24bit/192KHz. Other functions include iRadio, Blue tooth (apt X), USB, Spotify Connect and an optional DAB/FM module. It has three analogue inputs and six digital inputs so you've plenty of options there. Naim have been very clever in it's design as unlike most of Naims other Pre-Amps it has its own power supply meaning you can use it with other manufacturers power amps. They have also included the ability to upgrade the Pre with a separate power supply namely the XP5 XS, XPS or the 555 PS. When used this way immediate gains are heard as you are upgrading both the Pre-Amp itself and the streamer. To give you an idea of how good a Pre-Amp the NAC-272 is, it could be used with a NAP200, 250 or even a 300. We have been using it mainly with a NAP250 with a 555 PS driving a pair of Focal Maestro Utopia’s (we have on temporary loan from Focal) and the sound is quite superb. As I have said it can also be used outside of Naims stable with virtually any power amp. We tried it with a Bryston 4B to great effect as you could clearly here the Naims excellent insightfulness presentation and fantastic timing coming through. We have it in store now, so if you would like to come to the shop for a demonstration give us a call and see what the 272 can do for you. 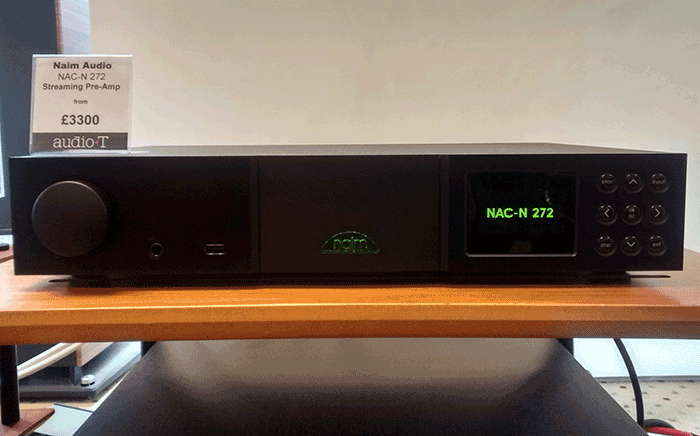 Naim products and the NAC272 are available from most Audio T stores. Check stores and availability.